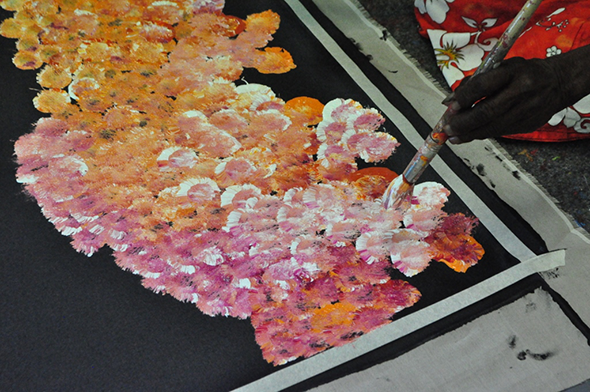 These artworks are produced using acrylic paints loaded onto a brush and the brush is then vigorously pushed into the canvas, linen or board in such a way that the bristles part and the paint is mixed in the resultant mark on the canvas. 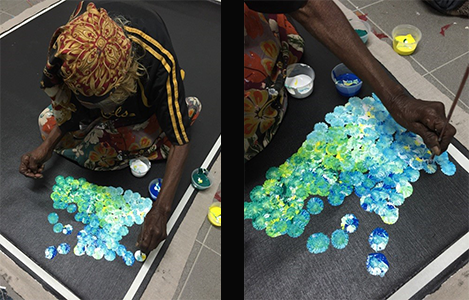 The extraordinarily talented Emily Kame Kngwarreye was the first to use this style, and it is said that the pounding of her brush could be heard two rooms away as she powerfully executed her artworks. 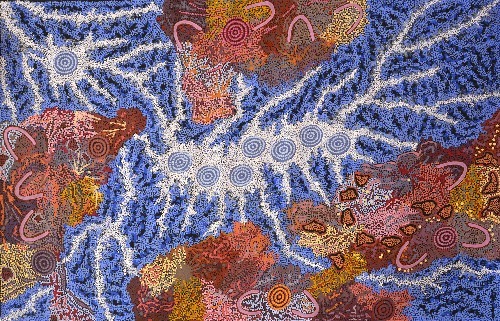 Different artists have used this style to advantage: Emily Kngwarreye in huge floating drifts of colour, such as that seen in 'Earth's Creation' and other major works; Polly and Kathleen Ngale as they cover their canvases with the myriad colours of the spring wild flowers; and Kathleen Ngale and Evelyn Pultara as they dub dub in lines to depict the bush yam .